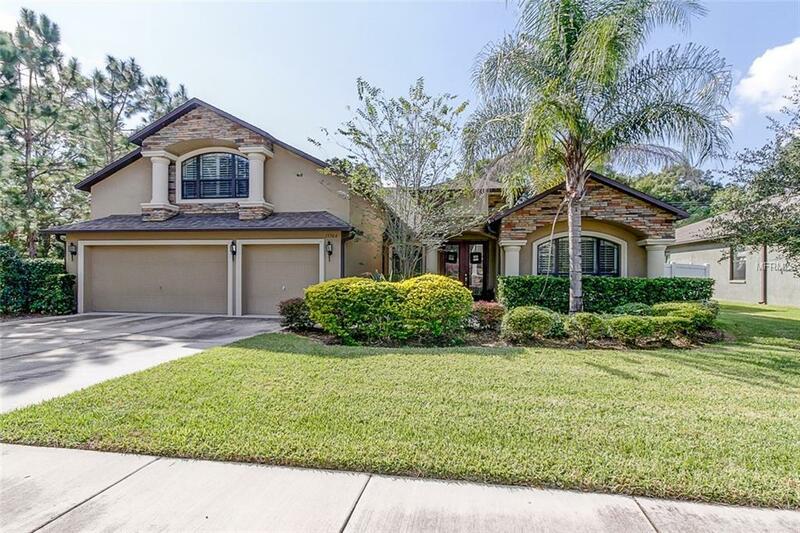 SUPERB CARROLLWOOD LOCATION! Enjoy all of the many conveniences of living close to all that Carrollwood offers - great restaurants, Whole Foods, Bob Sierra YMCA, fantastic shopping....it's all close by! This nearly new (2012 built) home is nestled on a quiet cul de sac and offers plenty of space with 4 bedrooms, plus a DEN/OFFICE, plus a RETREAT/PLAYROOM, plus an upstairs BONUS ROOM! The home is attractively appointed with today's paint colors, wood floors in all the bedrooms, granite countertops, GE stainless steel appliances including DOUBLE OVENS and a FRENCH DOOR REFRIGERATOR/FREEZER, a wine fridge, crown molding, 5 1/4 inch baseboards and PLANTATION SHUTTERS in the dining room and den/office. The floorplan flows beautifully with NO WASTED SPACE in this GREAT ROOM DESIGN with sliding glass out to the SCREENED lanai. The yard is fenced and there is PLENTY OF BACKYARD SPACE for play and pets! ROOM TO ADD A POOL! This home offers SO MUCH! Stacked stone exterior, a 3-CAR GARAGE, a security system, 10 ft ceilings....come see for yourself! This home is a terrific value in a prime location and is in IMMACULATE CONDITION!!! !